*GIVEAWAY IS NOW CLOSED AND WINNER IS ANNOUNCED AT THE BOTTOM* A while back, the nice folks at NeoCell Sport offered to send me a tub of the Recovery powder to review – I’d heard about the company from several fellow FitFluential ambassadors and was eager to try it so I happily accepted. Basically, this powder offers protein, connective tissue recovery, L-glutamine, and BCAAs that help recover, refuel, regenerate, and replenish you. Also, the chocolate flavor tastes delicious – always an essential in my book. I’ve used the powder several times now, usually after a milder skill based Crossfit workout, and noticed that it really did help my joints feel better – especially after things like handstands and ring work. What was most surprising was the fact that my husband, a man who has NEVER used protein powder in his life, LOVED IT. I’ve made him a shake with it every.single.morning since he first tried it – that’s how much he likes it. He said it gave him a noticeable increase in energy and has been helping his knees and back feel better after being on his feet in a kitchen all day. The verdict? This powder is definitely going to be in regular rotation in our house for my husband’s morning pick-me-up and in my own recovery routine. 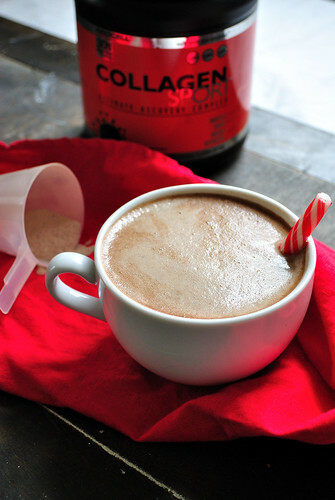 One of my favorite ways to use the powder lately is to make my own peppermint mochas. I used to adore peppermint mochas but stay far, far away from them due to the high sugar and questionable ingredients. The NeoCell Sport protein in chocolate flavor tastes amazing in this drink and it may be my new favorite way to get an afternoon caffeine boost. Whisk together milks, extract, cocoa powder, and protein powder while your coffee brews. Froth mixture using milk frother, espresso machine, or simply heat on the stovetop until warm. Pour into cup with coffee and sip. Seriously delicious stuff –and you could be making your own soon! The nice folks at NeoCell Collagen Sport offered to a do a giveaway for one of my readers so that you can try it out for yourself. Leave me a comment telling me about your favorite holiday drink! Like Gabby’s Gluten-Free on Facebook and leave me a comment telling me that you did so. Follow AND tweet: "I want to win @NeoCellSport from @GabbysGfree giveaway!" and leave me a comment telling me you did so. Giveaway closes Tuesday, Dec. 4th at 9pm. Good luck!